Yale University's School of Medicine is attempting to take its Physician Associate (PA) Program into the online realm with the help of a private partner. The new online Master of Medical Science degree would begin in January 2016 if the institution receives approval by various accrediting and licensing agencies. At Yale, the current PA program has three aspects: 12 months of lecture and small-group instruction; a 16-month clinical phase where students participate in clerkships in multiple sites; and research, where students work with advisors to develop their master's theses. The university is hoping that taking its program online will encourage its fledgling PAs to stay and work in their own communities. 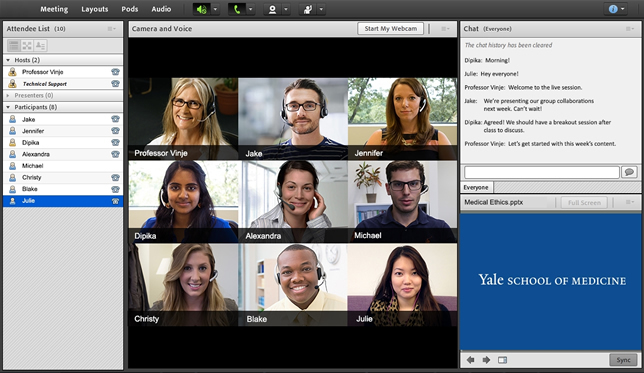 Students in the online program would have the opportunity for campus visits during some parts of their studies. "PA program students could come to campus during the first week or two in the program to experience Yale," said Program Director James Van Rhee. "Then at the end of the first year, they would come back to learn clinical skills and again at the end of the clinical year to do testing. A distant student could also do a rotation at Yale New Haven Hospital." Traditionally, partner 2U works with universities to develop online versions of their degree programs that run on its Web-based instructional platform. The company also frequently contracts to handle other aspects of a new program, such as recruitment and marketing. A unique aspect of the Yale project is that 2U will also work with the institution on organizing those clinical phase placements. The company claims that it has experience in facilitating more than 20,000 placements in other programs. Currently, in the healthcare field it works with Georgetown University and Simmons College. This is the first PA-oriented degree program the company will be involved with. A PA is licensed to perform physical exams, diagnose illnesses and develop treatment plans, order lab tests and prescribe medications, counsel and educate patients and, in surgical settings, suture wounds and assist in surgery. Unlike a nurse practitioner, the PA must work under the supervision of a physician. Yale is currently presenting its plan for the new degree program to the Accreditation Review Commission on Education for the Physician Assistant. That accrediting body meets in March 2015. If the approval goes through, the new online master's degree could begin accepting students in January.